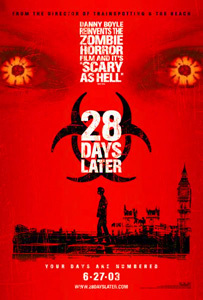 28 Days Later is a modern zombie flick which effortlessly rises above the standard Hollywood teen horror fare. Anyone longing for a modern answer to the classic Romero trilogy of the dead need look no further than this. A nasty virus has been unleashed on society and just 28 days later the country is in a desperate state, most people have been killed or succumbed to the virus which locks the victim into an uncontrollable murderous rage. A handful of survivors battle to find some kind of respite from the terrifying hordes but the remaining humans are just as dangerous as the zombies.